Cape Cod Sunset - Best Places to Experience the Show! A Cape Cod sunset can be a magical experience. Have you ever seen anything as beautiful as the sun slowly slipping into the water, casting brilliant hues of orange and purple across a huge expanse of the western sky? Because of the Cape’s west facing beaches, it is one of the few places on the east coast where you can experience magnificent sunsets over the water. The sunset views from Rock Harbor are unbelievably spectacular. Bring your chair and your favorite beverage, and prepare to be truly moved by the sheer beauty that mother nature can deliver. The gathering at Rock Harbor has been known to burst into applause as the last glorious glimpse of the sun’s hues slip into the bay. Rock Harbor is located at the end of Rock Harbor Rd, off of RT 6A. There is paved parking with no permit required. Votes From Our Readers for the Best Cape Cod Sunset! 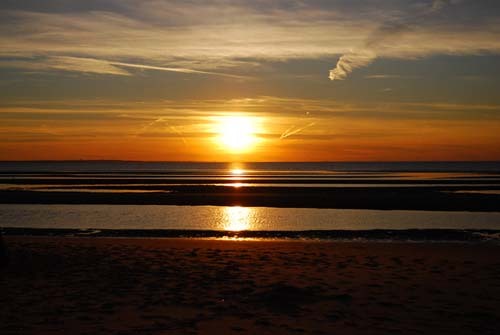 David – MA – The sunsets on the kingsbury beach bay side near the kingsbury cottages are the best sunsets in the world. Kathy – MA – 1st Encounter Beach has the best sunsets in the Eastham area! Plus it it is low tide kids/adults can walk out for miles finding treasures!! DON”TMISS IT!! Patty – NY – Herring Cove in Provincetown is the absolute best beach for us, and we, too, have experienced the ones where the crowd cheers and claps, as if we are at a magnificent concert. And we always are! Faith – MA – Rock Harbor has the magical sunset that dips into the bay, a bonus at low tide to walk out through the sand bars and sea water puddles. Vivek – MA – Rock Harbor! Annemarie – MA – My favorite beach to view the most spectacular sunset on the Cape is Corporation Beach in Dennis, MA. Lois – Boat Meadow Beach in Eastham! Please share your favorite place to experience a Cape Cod sunset in the comments below!